What are motocross knee braces designed to do? In high impact sports such as motocross, it is not uncommon for crashes to cause quite severe injuries that can take a while to heal. A moto knee brace is designed to help prevent these injuries from happening to you guessed it, your knees. The most popular form of severe knee injuries caused through motocross is a torn or damaged ACL. Your ACL is the tendon that connects your femur (thigh bone) to your tibia (shin bone). In motocross you will often see a damaged ACL when a racer lands a jump with their legs too extended, or they crash and have their legs hyper extended in the process. To prevent this, riders can wear motocross knee braces. Essentially, knee braces prevent riders from bending their knees the opposite way that a human is meant to (the brace stops hyper extension). Knee braces are often worn by people who have already suffered some knee damage because they help with support. Knee braces often have pads on them as well to protect the knee cap and prevent scraping injuries. 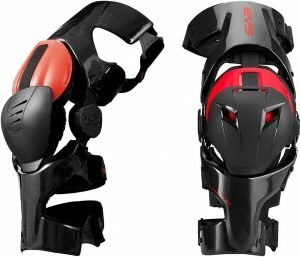 Should I wear knee braces? Chances are, if you are asking this question to yourself, you should definitely be wearing knee braces. Anybody who is even a little bit serious about motocross should have a quality set of motocross knee braces. The idea is prevention. Sure, it is great to wear a knee brace if you already have a bad knee. However, why not save yourself from the injury in the first place if you can? Buy a quality set of knee braces, and your knees will thank you for the rest of your life for it. To help you pick the best set of motocross knee braces, we have listed our top 5 picks for 2019 below. Starting off the list in a strong way is the X8 knee brace by Mobius. 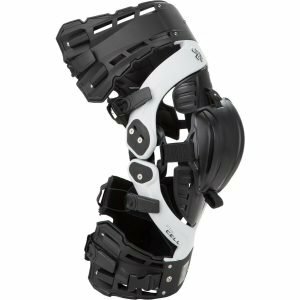 When you first glance at the brace you might perceive a strange oversized knee pad, but this brace is much more than that. Before I go into too much detail on the technology of the brace, I will quickly go over the basic information. The X8 motocross knee brace is available in grey / crimson and white / acid yellow. It is great that Mobius offered a couple of different color schemes to suit individual preference. Even considering the brace will almost never be seen since gear is worn over top. It comes in small, medium, and large. So there is no reason to worry about not finding a size to fit you. In total the brace weighs about 432 oz which is pretty standard as far as modern knee braces go, if anything it is a bit lighter than others. As for protection, this brace has you covered. The patent pending Continuous Cable Routing System or CCRS for short is claimed by Mobius to form “an unparalleled system of support and protection”. After looking into the brace more, I have to agree with that claim. The CCRS makes use of cable which has been routed through the brace in such a way that it reinforces all of the cruciate ligaments externally. This means that during a crash or impact, the braces will keep your knees from moving any way that they should not be. The tendon back plate is tightened as you spin what is similar to a boa system that you find on many ski and snowboard boots. This system ensures the correct fit of the brace. While we are on the topic of fitment, it is important to mention how customizable this brace truly is. The patella plate can be changed between a couple of different sizes to best fit your knee cap. This plate protects from any direct impacts on the knee cap. You can also change the EVS foam liners to thicker or thinner versions on different parts of the brace so that it accurately fits your personal physiology. The EVS foam liners are soft to the touch and allow the braces to be worn without the use of knee brace socks. However, this does not mean you cannot use them, if you choose the brace works just as well with them on. There are two things that stood out as far as the best features of this moto knee brace. One thing was the unique customizable fit. The only way you can really say that this brace doesn’t fit you right is after altering pads, plates and adjusting the cable to no avail, and this is just something that is unlikely to happen. The other top feature to this brace is the full support and protection. This brace literally makes your knees feel unbreakable. That sort of assurance can go along way, especially for people who have had previous knee injuries and know how much pain and inconvenience they can cause. Next on the list is the popular EVS Web Pro Knee Braces. Unlike the Mobius, this brace by EVS is the exact image that comes to mind when you think of what a motocross knee brace should look like. It only comes in one colorway which is red and black /carbon fiber. Only being offered in one color seems perfectly fine as the brace will not likely be seen by anybody. However, if color is a big deal to you and red and black is not your style, then you may as well stop reading here and move onto the next brace. As far as sizing goes the brace can be bought in a small, medium, large, or extra-large. You can also buy the braces singularly in case there is only one knee that you require the support for. I would always recommend buying one for each knee anyway, and at the same time as well so that they bed in evenly. These braces are much lighter than the old version of the Web knee brace. This is likely due to the use of duel density carbon fiber as the main frame for the brace. EVS tried to emphasize their Web Pro knee braces as being one of the most anatomically natural feeling motocross knee braces out there. What does that mean? Essentially the braces mimic a human knee but restricts any excess movement in order to protect from irregular bending and hyper extension. One of the features that separate this brace from others is the adjustable hyperextension lockouts. Every knee can bend differently in small variances. So this adjustment allows you to make the brace work for you as best as possible. The kneecap guard is one of my favorites from any braces. As the knee bends, one guard stays in place while another one slides with your knee. This sounds a little strange but if you watch a video or see some other sort of visual demonstration it is clear to see that your knee cap remains protected during every stage of leg extension. The importance of this is really evident when thinking about violent motocross crashes and how your body can ragdoll around, you want to be protected no matter the angle you land at. Just like in the old Web brace, the new Web Pro makes use of a “sharkskin” neoprene liner that keeps the brace from shifting around when riding. Overall the brace is extremely stiff (thanks to the duel density carbon fiber frame) and quite comfortable. One of the best features of this moto knee brace would have to include the patented Tru-Motion 3.0 dual alloy hinges. The knee movement as a result feels extremely natural and that is exactly what you want. 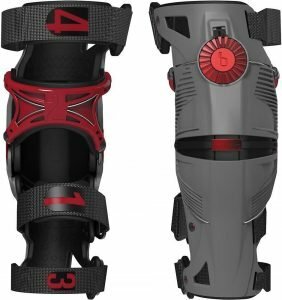 The other favorite feature of this brace is the duel defense knee cap. Like explained above, it leaves your patella protected at all times, and after seeing a knee cap smashed into multiple pieces, this is a big checkmark. 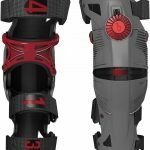 The Troy Lee Designs Catalyst is a strong contestant for the best moto knee brace. First off it is important to mention that this brace is classified as a medical grade brace. Although I’m sure some, if not all of the other braces on this list are also the same, Troy Lee Designs points it out leaving a sense of clarity when it comes to the high standards of support. This brace comes in white with classic Troy Lee styling on the graphics attached. As far as sizing goes, the braces are available in small, medium, large, extra large, and extra extra large. Be sure when putting on the braces that you wear the proper one for the leg you are putting it one. The left and right differ a little bit to bit the shape of your leg better. Troy Lee Designs kept things simple with this brace making use of 7000 series aluminum for the frame. The aluminum is lightweight, durable, and stiff. All characteristics that a quality knee brace should have. The brace is quite slim considering the amount of support it offers. Less bulk means more comfort under motocross gear. There are many riders out there if you read other reviews that say that they forget the braces are even there sometimes. That is exactly what you want, so clearly the slim profile is a big hit. However, it takes more than a slim profile to ensure comfort, and that’s is why Troy Lee Designs also incorporated the Tibial Docking System to this brace. It comfortably attaches to the riders leg and keeps the brace very secure, even when riding rough motocross tracks. To make the brace feel like a custom fit, the whole brace frame is considered moldable and conforms to the rider’s anatomy when secured. You can even adjust the stop points on the brace for extension and flexion. Like any good brace, your patella is protected, although not quite as well as in the two motocross knee braces above. The nice feature about this patella guard though is that it is removable for washing. The material on the inside of the brace is moisture wicking and does a superb job of keeping sweat from building up under the braces. These braces are also used by athletes for bmx, and mountain biking. So if you are a multidiscipline athlete, these are definitely a good choice. They are nicer to pedal with than many other heavier braces, and although this is a motocross review, that is definitely a note worthy point. All of the braces have different features that make them stand out. In the Troy Lee Designs Catalyst X Knee Braces, it’s the slim profile. Riders love when they forget that they are wearing any sort of protective gear so that is a huge plus. The other thing that makes these motocross knee braces superior to a lot of others is the great moisture wicking properties. Nobody likes sweaty knee braces. Not to say these do not get sweaty, it’s just they are a lot better than many others out there. The Ultra Cell knee braces by Asterisk are so full of technology it is almost hard to comprehend. Picture a standard base model ford focus, it works, but isn’t anything special. That is a regular, cheaper brace. The Ultra Cell however, is more like a fully loaded Ferrari. It is made with top quality materials and is a state of the art design. As a result, the price is also one of the highest that you will find for motocross knee braces. However, before we get into that, here are the basics. The braces come in 3 color options, black, white, and red. As far as sizing goes, you can purchase these braces in small, medium, large, and extra large. Any rider should be able to find these braces fit well, especially considering the adjustment. Talking about protection of motocross knee braces can get rather repetitive. All braces essentially stop hyper extension and protect the knee cap in one way or another. However, each brace does so in a different way. So let’s talk about what makes Asterisk’s Ultra Cell brace so good. Starting off with the frame, Asterisk made sure the brace was anatomically correct. The actual build of the frame is made from a stiff carbon fiber epoxy which is of course also quite lightweight. As far as bending the knees go, an asymmetri-glide hinge is used. This hinge is supposed to track the natural motion of your knee throughout flexion and extension. It also allows for automatic tibia alignment for the lower part of the brace. Like on the other braces you can also adjust the extension range. Condyle shims can be used to make the fit of the brace more precise. Talking about how this brace stops you knee from moving the wrong way is near impossible as there are so many technical features. However, all you really need to know is that the A.R.C (adjustable retention control) cuff will keep everything how it should be in the event of a crash. There is also an anti-rotation tether that links the boot to the brace to help transfer forces of lower leg rotation. The knee cap protection on this brace is an all around winner. It is a 3 layer telescoping guard that offers maximum protection in any position. The padding of the brace forms to your leg once you warm up making it very comfortable. Especially when taking into account all of the straps and the fancy boa system that tightens the brace evenly all around. To top it off the Asterisk Ultra Cell motocross knee braces are also water resistant and includes undersleeves. It is hard to list the best features of a brace so advanced. However, the tele-tri patella cup is an all-around winner for knee cap protection. The glide hinge is also a winner as it allows for such a natural bend. The K8 knee brace by POD is an ideal motocross brace. However, due to its removable protection panels and natural fit, the braces can be used for just about anything. The brace comes in a sleek carbon and blue color combo which is probably my favorite out of all of the braces on this list. As far as sizing goes it is the pretty basic small, medium, large, and extra large. 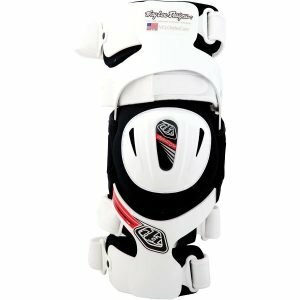 If you are looking for a brace for a young child then the K1 knee braces are a good option as they are designed for youth. Staring off, I would like to mention that the frame of these bad boys carry a 5 year warranty, and the brace itself has a 1 year warranty. If that is not piece of mind I don’t know what is. The braces also qualify for reimbursement under many healthcare plans so if you are thinking of getting a set and have health insurance, check to see if they cover them. 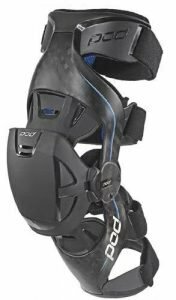 The frame of the POD K8 knee braces are made of carbon fiber, and similar to the other braces, are light and stiff. These are probably the lightest feeling when riding though. They are also extremely slim and have almost no excess bulk to them. Despite their sleek build, the braces have a secure fit. No unwanted shifting is a pleasure and when POD says that the brace has 0 pressure points, they aren’t lying. Many of the panels are removable as I mentioned above. This includes the knee cap plate. 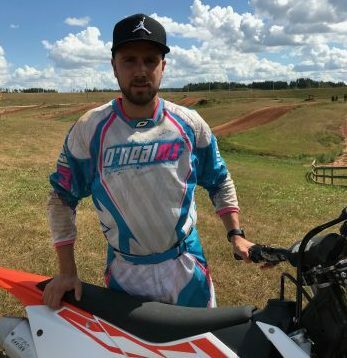 As a motocross athlete, a knee cap plate is definitely recommended to be used but if for some reason if you do not want it, it is good to be able to remove it. The K8 by POD is a simple brace that is very effective. If simplicity is what you are after, then this could be the best motocross knee brace for you. The best thing about the POD K8 is its extremely slim profile. For riders who grip the bike a lot with the inside of their legs, this is a great option as it is so much less bulky than other options. The next best thing about the POD K8 is its ability to shed panels and be used for multiple different activities. It is much easier to justify buying expensive motocross knee braces when you can use them for multiple activities rather than just motocross. All of the braces listed in this article are truly phenomenal. Each one has its own benefits and downfalls. As a motocross racer or rider, it is important to get the best moto knee brace for you. Read over the article, and do your own research. Buy a quality set of knee braces and your knees will be thanking you for the rest of your life. With great motocross knee braces you should also have a great dirt bike helmet. If you need any help choosing one, then here are the best dirt bike helmets 2019.